I am often asked what I eat as I don’t eat meat and I don’t purchase anything that comes in plastic. I am finally going to answer that with a better answer than “I dunno, beans and veges and stuff.” Here is a look at what I ate last week. DISCLAIMER: I am not the healthiest person in the world and I am not a chef! Weetbix: I buy my weetbix plastic & package free from Bin Inn, I usually use an old extra-large Ziploc bag as this is by weight and Weetbix can be a bit messy for mesh bags, also I purchase a decent amount. I usually soak my Weetbix in hot water and any leftover milk (not used for yogurt/cheese making) with yogurt, honey and chia seeds on top. Lunch is usually leftovers from the night before, occasionally I will buy my lunch at work where I am fortunate enough to have plastic free and vegetarian options available at the staff cafe. If I buy a salad I take a small scout bowl with a lid which lives in my desk drawer, alongside silverware. Pizza: Made by The Boyfriend, he made the base using whey from our cheese making. Toppings included leftovers, mushrooms, red onion, spring onions, homemade ricotta and anything else that needed to be eaten. 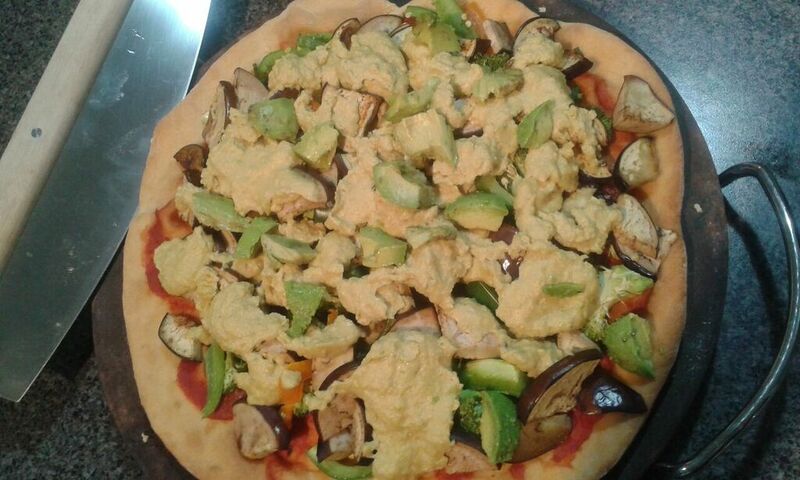 I ate the pizza before a photo (whoops) so have included a photo of another homemade pizza, this one had nut cheese, eggplant and avocado. 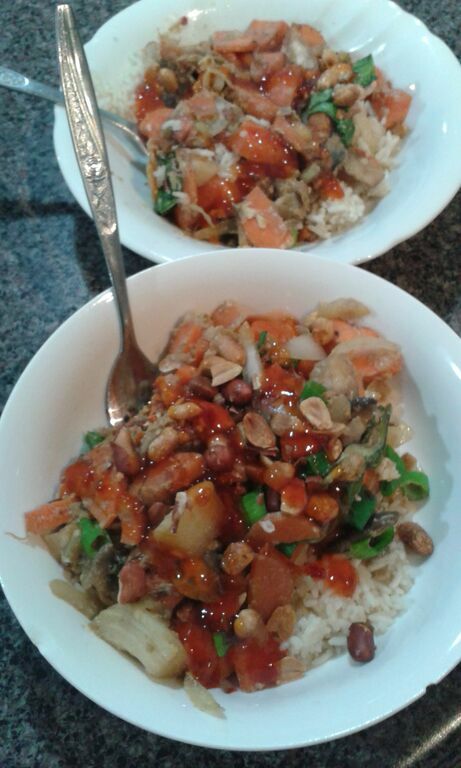 Stir Fry: A very last minute, not planned ahead meal that involved throwing things into a wok and cooking rice. It was surprisingly tasty (pictured below). Burgers: The Boyfriend made this one again, he was very experimental with the patties which were made with polenta. The burger buns were from the supermarket bakery. No photo for this one as I was very hungry. Soup: Red lentils, carrots, cashews & peanuts, veggie scrap stock and leftover whey. 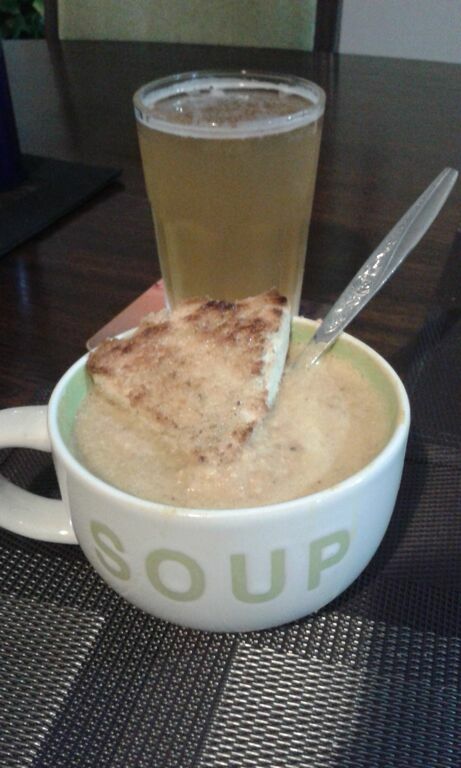 Served with bread. The drink is a beer/kombucha mix. Takeaway Pizza: Saturday was our cheat day, we bought Domino’s pizza and composted the pizza boxes. Experimental Vegan Night: Chickpea chips (didn’t quite work out), mushroom “steak” and steamed puha which was growing around our citrus trees.